The United States Sanitary Commission was a private relief agency created by federal legislation on June 18, 1861, to support sick and wounded soldiers of the U.S. Army during the American Civil War. It operated across the North, raised an estimated $25 million in Civil War era revenue and in-kind contributions, to support the cause, and enlisted thousands of volunteers. The president was Henry Whitney Bellows, and Frederick Law Olmsted acted as executive secretary. It was modeled on the British Sanitary Commission, set up during the Crimean War. Also active in the association was Col. Jonathan Hunt, planned to attach Lincoln's signature to copies of several casts of the President's hand, to be sold to raise funds for the war effort. Arising from a meeting in New York City of the Women's Central Relief Association of New York, the organization was also inspired by the British Sanitary Commission of the Louisa May Alcott, Almira Fales, Eliza Emily Chappell Porter, Katherine Prescott Wormeley, Mary Livermore and many others. Organizing the Sanitary Fairs offered ways for local communities to be directly part of supporting the war effort of the nation. 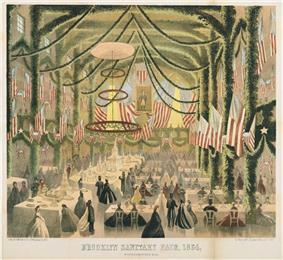 The first Sanitary Fair during the war was held in Chicago from October 27 to November 7, 1863. Called the Northwestern Soldiers' Fair, it raised almost $100,000 for the war effort. It included a six-mile-long parade of militiamen, bands, political leaders, delegations from various local organizations, and a contingent of farmers, who presented carts full of their crops. 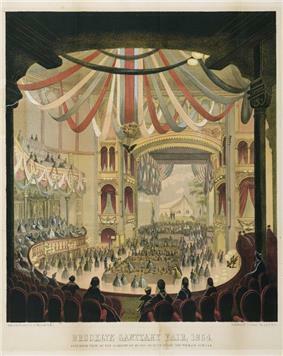 The fairs generally involved large-scale exhibitions, including displays of art, mechanical technology, and period rooms. These sorts of displays called upon ideas of the American past, a history that local communities held in common. Often, different communities competed with each other over their donations to the national cause. People in various cities and towns across the North contributed to the same war effort because they identified as having shared fortunes in their common nation. The USSC leadership sometimes did not approve of the excitement and lavishness of the fairs. They wanted to encourage sacrifice as a component of membership in a nation. Although the fairs were one way to create a national identity which might motivate citizens to perform their duties, the commission leadership did not want the fairs to become the focus of USSC work. During the American Civil War the U.S. Sanitary Commission operated 30 soldiers' homes, lodges, or rests for Union soldiers. This soldiers' home was at Camp Nelson, Kentucky. 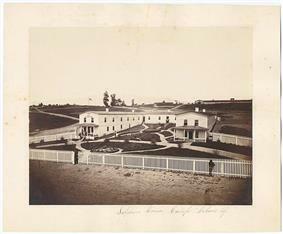 In addition to setting up and staffing hospitals, the USSC operated 30 soldiers' homes, lodges, or rest houses for traveling or disabled Union soldiers. Most of these closed shortly after the war. Letter from Col. Henry Whitney Bellows served as the President of the Commission. Samuel Howe served as a Director of the Commission. Frederick Law Olmsted served as the Executive Secretary of the Sanitary Commission. States could use their own tax money to supplement the Commission's work, as Ohio did. Under the energetic leadership of Governor David Tod, a War Democrat who won office on a coalition "Union Party" ticket with Republicans, Ohio acted vigorously. Following the unexpected carnage at the Battle of Shiloh in April 1862, it sent three steamboats to the scene as floating hospitals with doctors, nurses and medical supplies. The state fleet expanded to eleven hospital ships. The state also set up 12 local offices in main transportation nodes to help Ohio soldiers moving back and forth. The U.S Sanitary Commission is memorialized by a group of re-enactors who portray The Boston Branch of the commission at various civic events, educational programs, and Civil War re-enactments. The group is based out of the Greater Boston area of Massachusetts. ^ Dugan, Ianthe Jeanne (June 22, 2007). "Civil War Letters Shed Light on Pain Of Troop's Families" (subscription required). ^ a b "Great Central Fair Buildings, Philadelphia". ^ a b Lawson, Melinda. Patriot Fires: Forging a New American Nationalism in the Civil War North, Lawrence, Kansas: University Press of Kansas, 2002. ^ "Soldiers' Homes and Lodges" in The Sanitary Commission Bulletin 3:1279. Available at Google Books. 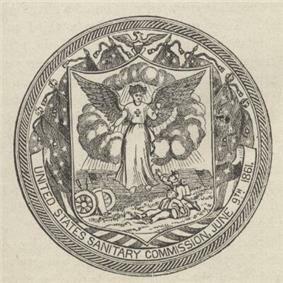 ^ "US Sanitary Commission historical website". Retrieved December 23, 2005. The United States Sanitary Commission Philadelphia Branch collection, containing materials on several humanitarian efforts made by the association during the Civil War, are available for research use at the Historical Society of Pennsylvania. List of 30 USSC soldiers' homes, lodges, and rests in 25 cities in 15 states North and South in 1865.